Pictured is Emma Parry and some of her family with her Ohio State Fair Grand Champion Feeder Calf. 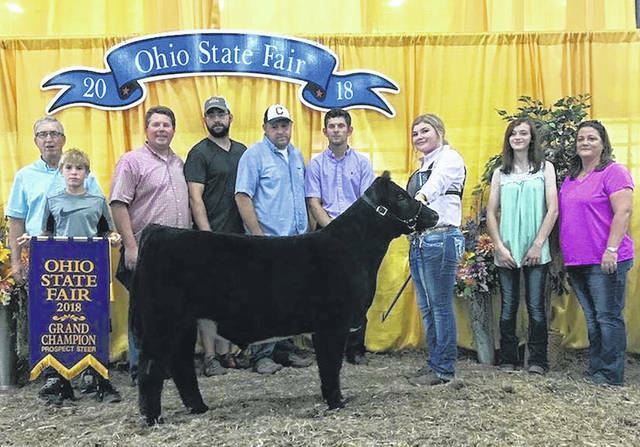 During the two weeks of the 2018 Ohio State Fair, many Hillsboro FFA members exhibit livestock, competed in showmanship, and many other fun activities. Gavin Puckett, Emma Parry, Riley Burba and Heather Burba all exhibited beef. Puvkett placed first and his class and won his division with his heifer. Parry placed first in her class and had the Grand Champion Feeder Calf. Riley Burba placed first in his class with his heifer. Heather Burba placed first with both heifers and had a grand and reserve champion heifer. Members who exhibited goats were Ashlie Hillyer, Kelcie Thronburgh and Claire Wilkin. Hillyer placed second in showmanship, second in class with her wether, and second and third with her does. Thornburgh placed fifth in showmanship and placed fifth in class with her wether. Wilkin placed third in showmanship and placed second in class with her wether. Lana Grover exhibited swine and also participated in skillathon. She placed sixth in class with her Berkshire barrow and placed fourth in skillathon. https://www.timesgazette.com/wp-content/uploads/sites/33/2018/08/web1_Hillsboro-FFA.jpgPictured is Emma Parry and some of her family with her Ohio State Fair Grand Champion Feeder Calf.